Join us for this FREE Lunch & Learn presentation. Atrial Fibrillation, or Afib, is a condition where the heart beats irregularly at a high rate. When severe, this condition can lead to a heart attack or strok. Aimee Seaman, FNP-Cardiology, will discusss signs and symptoms of Afib and the several treatment options available. Lunch will be served at 11:45 a.m. prior to presentation at noon. A short question and anwser period will follow presentation. FREE. Reservations are required for our caterer and seating is limited. 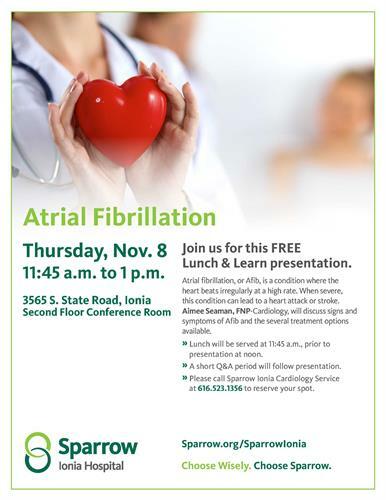 Please call Sparrow Ionia Cardiology Services at 616.523.1356 to reserve your spot.